To say I was honored to be invited to become a contributor to Historical Tapestry would be an understatement. 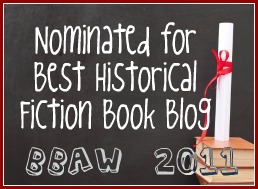 I have really enjoyed being a follower of the blog as well as participating in last year's Historical Fiction Reading Challenge so to now be a part of it is just so exciting for me! Now let me tell you a little bit about me. My name is Colleen Turner and I live in the Tampa Bay area of the sunny state of Florida. I am a Student Service Representative for a university and really enjoy working with students to assist them in accomplishing their dreams of completing their education. I am married to a wonderful man and have an active, awe-inspiring eight-year-old son. When I'm not working or tending to the family I can be found with my nose stuck in a book. I have always had a love of reading and historical fiction is by far my favorite genre. While I don't remember the first historical fiction book I read I do remember the one that solidified my love for it: The Other Boleyn Girl by Philippa Gregory. I started it on a long, boring car ride and became completely swept away in the history and drama. I've never looked back! Beyond historical fiction I also love historical nonfiction, literary fiction, women's literature and, from time to time, some mystery and suspense. I'm really willing to give most anything a try as long as it isn't a western. I have been a reviewer over at Luxury Reading for a few years now and have really enjoyed meeting all the other wonderful bibliophiles out in the blogosphere. I can't wait to begin sharing my love of reading with each and every one of you. Cheers! Congratulations! Colleen. This should allow you to read loads of historical fictiion. I will be looking forward to your reviews! Excited to see your reviews and get to know you! Thank you, Carol, I am so excited!!! Thank you, too, writerrobynlarue! I am looking forward to getting to know all the lovely followers of the blog! !